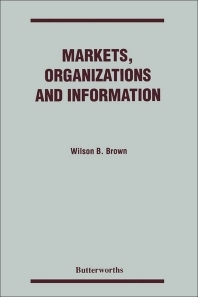 Markets, Organizations and Information: Beyond the Dichotomies of Industrial Organization discusses the functions of institutions in solving economic problems. The book is comprised of 12 chapters that tackle aspects of industrial organization. The first chapter discusses ways to approach industrial organization. Chapter 2 covers the growth of the business firm from a historical perspective. Chapter 3 discusses the development of an actual theory of the firm. Chapter 4 talks about the appropriation of benefits, and Chapter 5 tackles the risk and capital in an information failures network. The book also discusses the market-like behavior within the firm, and then covers joint costs and benefits. Firm-like behavior, allocative inefficiency, x-inefficiency, and corporate takeovers are also explained. The book then covers the economic role of marketing, the vertical integration, and the product life cycle. The last chapter covers the multinational firm. The text will be of great use to readers who have an interest in neo-institutional analysis.